The City of Hudson Fire Department is pleased to announce they are recipients of a Oxygen Grant, awarded by the Divers Alert Network (DAN). The Fire Department was given a DAN Dual Rescue Pak Extended Care Oxygen Kit to be used in case of an emergency while operating at a Dive call or drill. The Oxygen Kit came at no cost to the fire department. 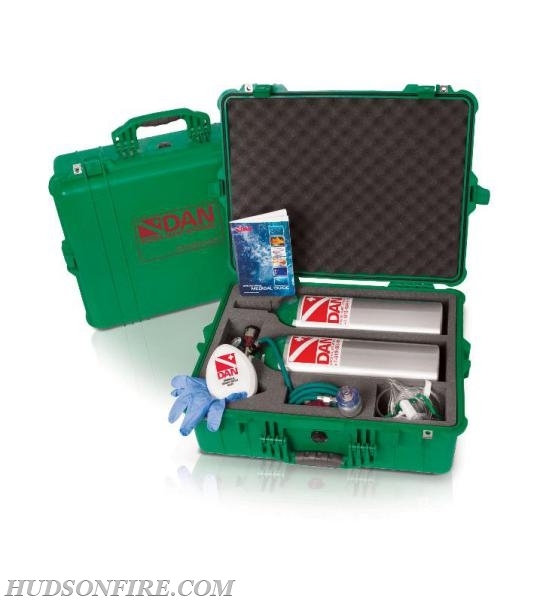 The DAN Dual Rescue Pak Extended Care Oxygen Kit was received in early August and immediately placed into service. The unit is housed on the fire departments Water Rescue Truck 17-70, which responds to all water emergency calls. Oxygen, water and food are necessary for life, and of the three, the lack of oxygen will lead to death most rapidly. Dive injuries such as lung barotrauma, decompression illness and near drowning decrease a diver’s ability to metabolize oxygen. Providing emergency oxygen at concentrations nearing 100 percent can reduce damage to oxygen starved tissues, making a dramatic difference in the injured divers’ conditions, and improving their response to further medical treatment. Through the Oxygen Grant Program, DAN provides emergency oxygen units to individuals, businesses and organizations that have a connection to diving or aquatics and can demonstrate a genuine need of oxygen in the pursuit of their interaction with the dive or aquatics communities. This program is funded entirely by donations. The Divers Alert Network is he largest association of recreational scuba divers in the world. DAN is supported by membership dues and donations. DAN's mission is to help divers in need of medical emergency assistance and to promote dive safety through research, education, products and diving services. L to R: 2nd Asst. Chief/Diver Nicolas Pierro, Director of Water Rescue Services/Diver Dan Hickey Jr, Lt./Diver Justin Elliott, Captain/Diver John Gambino were on hand to place the new oxygen kit into service.